Winter Hair Protection – All-Natural Restoring Hot Coconut Oil and Lavender Hair Mask. - Amphora Aromatics Ltd – Supplier of pure essential oils and aromatherapy Products. Winter Hair Protection – All-Natural Restoring Hot Coconut Oil and Lavender Hair Mask. Winter Hair Protection – All-Natural Restoring Hot Coconut Oil and Lavender Hair Mask. 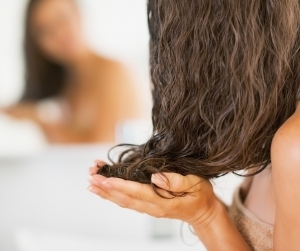 Click to discover how to make your very own Hot Hair Mask! This is a lovely mask to heat up before applying to your hair. Hot oil treatments are a popular choice due to its ability to open up the pores on your scalp. It’s a naturally effective way of adding shine, sheen and vitality to your hair during the cold winter months. The molecular structure of Coconut Oil makes it ideal for repairing damage and restoring the hair as it is able to penetrate the hair directly, rather than just sit on top of it like a lot of conditioners do. It is rich in Vitamins E and the Lauric acid it contains make it a valuable oil for giving shine and life to our hair. Lavender works really well alongside Coconut Oil. The scents work beautifully together and the versatile essential oil helps the hair in various ways. It increases blood circulation which in turn promotes hair growth, is a natural anti-fungal and so is useful in treating dandruff. It’s also a great conditioner, helping your hair feel soft, shiny and fragrant. 5 drops Lavender Essential Oil. Virgin Coconut Oil will need to be melted down before applying to the hair anyway as its melting point is 75 degrees Fahrenheit (anything below and it will remain solid - usually the case during winter!). Take 25ml of Coconut Oil (you may need a spoon to scoop it out – roughly one and a half tablespoons will do.) Again, you can increase the volume if you have extra-long hair but remember a little bit goes a long way! Coconut Oil can be quite a challenge to wash out of the hair so it’s wise to go easy with it. Place the oil into a jar and add 5 drops of Lavender. Place the jar into a pan of boiled water and stir until it melts down into a warm, liquid constancy. When you’re done, bring your warm mixture up to the bathroom and proceed to massage it thoroughly through your hair. The mask should be put on your hair before it's washed. Start with gentle, circular motions at the roots and work through until you reach the ends. Massaging in circular motions will help stimulate the hair follicles and aids circulation, this will really help with hair growth and strength – plus it will make you feel lovely and relaxed, making the treatment that extra bit luxurious! When you’ve covered your hair thoroughly, cover your head and wait (for extra heat, run a towel under hot water, then wring it out. Wrap the towel around your head and then wait for the treatment to take its course). A minimum of 30 minutes would be advised but the longer you leave it in, the more you’ll benefit from it. Then wash your hair (you might find you need a couple of washes to ensure it's washed out properly). I hope you enjoy this beautiful, simple and natural recipe. Stay tuned for more to come!